At the Auckland Food Show this year I decided to focus on what was a different, new and innovative rather than just wander around snacking on everything on offer as I usually do. 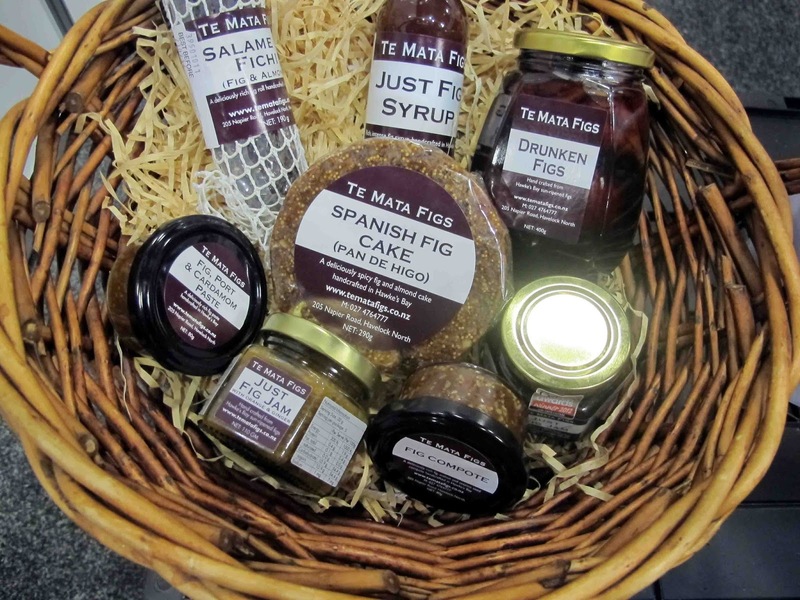 If you don't have a plan It's all too easy to become overwhelmed by such a vast selection of food and drink..
A Spanish Fig Cake (Pan de Higo) made by Te Mata, an artisan company from Hawkes Bay. This chewy figgy treat is rather like Panforte. It comes two ways: a healthy version with no added sugar and a second one with added chocolate .This one a little naughtier and was my favourite. It would be perfect to hand round after dinner with coffee. Misomite: a Japanese version of Marmite made by Urban Hippie in Nelson. Made from New Zealand grown soya beans and locally harvested sea salt. It is full of protein, vitamin B12 and minerals so it’s very healthy. I’ll be spreading it on toast for breakfast to acquire the taste. I loved their Miso soup as well. Silver Fern Farms were serving little chunks of roast venison and lamb straight out of the oven. They were too irresistible. I greedily went back for seconds .Then I bought some of their venison to take home for dinner. The Mc Cashin’s Family Original Stoke Bomber Smoky Ale sounded like a dangerous brew but turned out to be a very quaffable beer with a wood smoked caramel flavour .It was strong but not too bitter. Or as they call it in France: Soupe a l’oignon .This very traditional soup consists of caramelised onions in a beef broth and was created by Tomette, a local French company. They use only fresh ingredients .It was rich and deeply flavoured, as good as homemade. Buying some sachets of this will save me from having to chop a pile of onions. Made by Hipi it makes good use of some of our millions of sheep. It comes plain or with a dash of honey which masks the rather distinctive sheep milk’s flavour. Sheep’s milk yoghurt has long been very popular in Europe and should become here as well. The Sade organic apricots looked rather small, dark and uninviting but once I popped one into my mouth I loved the intense flavour. They are imported from Turkey. This is a mixture of their peanut butter and New Zealand made dark chocolate. It has 70 percent less sugar than most chocolate spreads and tastes seriously good. Move over Nutella! I’ll keep indulging in this. Footsore and slightly overwhelmed by so much food and drink on offer I stopped off at Dilmah’s Tea stall and was revived by a cup of their green tea with cinnamon, peppermint and ginger.